The leatherback (Dermochelys coriacea) ranges widely throughout the Indian Ocean, although nesting appears restricted to a few scattered areas (Nel et al., 2015). In the northeast Indian Ocean and Southeast Asia, leatherbacks nest on the Indian mainland (small numbers), Andaman and Nicobar Islands, Sri Lanka, western coast of Thailand (small numbers), Sumatra, and Java (Nel et al., 2015). e current situation in Myanmar with regards to leatherback reproduction is unclear. Historically, Maxwell (1911) reported leatherbacks nesting along the coast of Arakan (now “Rakhine”) State and Tenasserim Division (now “Tanintharyi Region”). However, the current status of these nesting populations is unknown and leatherbacks together with hawksbills (Eretmochelys imbricata) are considered the rarest of the five species of marine turtles occurring in the coastal waters of Myanmar (Holmes et al., 2014; Thorbjarnarson et al., 2000). We here report a recent confirmed record of D. coriacea nesting in Lampi Marine National Park (LMNP), Myanmar. LMNP (10°50ʹN; 98°12ʹE; Figure 1) encompasses parts of the Myeik (formerly “Mergui”) Archipelago in Tanintharyi Region of southernmost Myanmar (Beffasti & Galanti, 2011). LMNP is administered by the Nature and Wildlife Conservation Division (NWCD) of the Myanmar Forest Department, and consists of Lampi Island and several smaller satellite islands, surrounded by an unmarked and ill-de ned marine protected zone (Platt et al., 2015). Although permanent settlements are prohibited on Lampi Island, four large villages (Ma Kyone Galet, Warr Kyun, Ko Phawt, and Salet Galet) containing in total > 3,000 residents are established on satellite islands within the boundaries of LMNP (Beffasti & Galanti, 2011: 51; Platt et al., 2015). Harvesting marine resources (primarily sh, squid, and sea cucumbers) provides the principal source of income for island communities (Beffasti & Galanti, 2011; Platt et al., 2015). A biodiversity survey conducted in 2014 documented the occurrence of three species of marine turtles, including D. coriacea, E. imbricata, and Chelonia mydas in LMNP (Platt et al., 2015). Known locally as Leik Zaung Lyar (= star fruit turtle), D. coriacea is regarded by fishers as extremely rare in LMNP and adjacent waters. A small turtle (carapace length ca. 400 mm) found dead on a baited hook in 2012 was the only recently verified occurrence of D. coriacea documented by Platt et al. (2015) in LMNP. Six beaches in LMNP (Bi Thaung, Kyauk Phyu Aw, Wah Ale Kyun, Honey Moon Beach, Hline Gyi Aw, and La Pyat Aw) are used for nesting by marine turtles (primarily C. mydas) (Figure 1). Although all sea turtles and their eggs are nominally protected, enforcement of existing laws was weak to non- existent at the time of the survey and most turtle eggs were being illegally harvested for domestic consumption or sale in local markets. Monitor lizards, semi-feral dogs, and macaques destroyed other turtle nests that escaped anthropogenic predation (Platt et al., 2015). 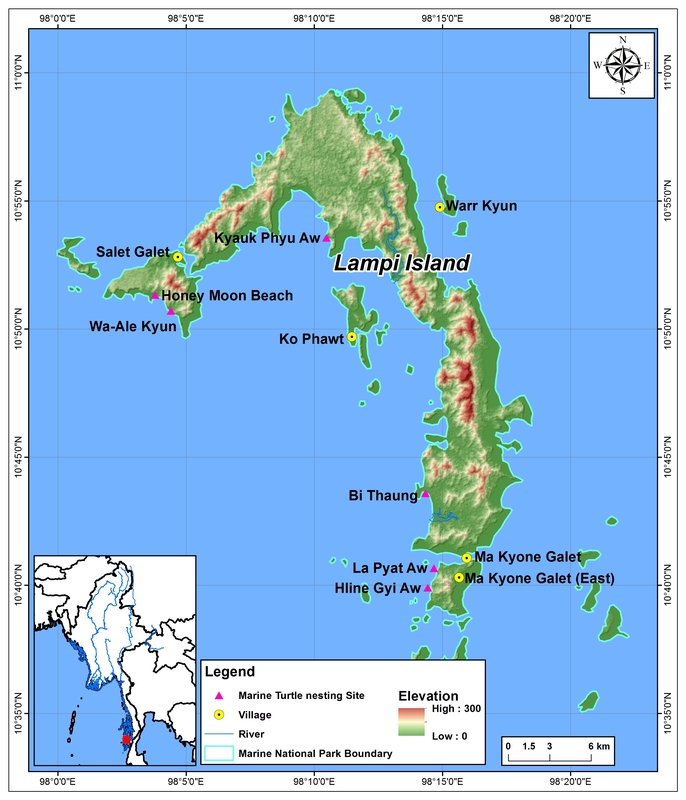 Figure 1: Lampi Marine National Park, Myanmar, showing locations of villages and marine turtle nesting areas. Map modified from Platt et al. (2015). Given the ubiquity of these threats and the absence of effective law enforcement, Platt et al. (2015) recommended that community-based marine turtle conservation efforts be implemented in collaboration with eco-tour operators granted concessions within LMNP. In accordance with this recommendation, a turtle nest protection and monitoring program was initiated by Wa Ale Resort (Lampi Foundation) working together with NWCD during late 2015. As part of this effort, locally hired “Beach Wardens” conduct daily patrols of Wah Ale Kyun and Honey Moon beaches to search for signs of turtle nesting activity. During the 2016-17 nesting season, when freshly laid nests were encountered during patrols, they were marked and allowed to incubate in situ. Warning signs were posted at each nest and Beach Wardens provided 24-hour security to deter potential egg collectors. At the end of incubation, hatchlings exited the nests unassisted and made their way into the surf. On the morning a er primary hatchling emergence, each nest was excavated to search for dead hatchlings or those that had been unable to successfully exit the nest chamber; the latter were collected, held until nightfall, and then released. Basic data were recorded for each nest, including dates of egg-laying and hatchling emergence, number of hatchlings (dead and alive) and unhatched eggs found when the nest was excavated, and species identification. During the 2016-17 nesting season, 22 C. mydas nests and one D. coriacea nest were found on Wah Ale and Honey Moon beaches. Nesting occurred from 16th November 2016 through 7th May 2017, a period coinciding with the annual dry season in southern Myanmar. The single leatherback nest was found on Honey Moon Beach on 27th December 2016 the morning a er the clutch was laid. Hatchlings emerged from the nest on the night of 22nd-23rd February 2017 following an incubation period of 59 days, within the range of eight to nine weeks given by Hirth (1980). Egg-laying occurred two nights before the New Moon (29th December 2016) and hatchlings emerged three nights before the New Moon (26th February 2017). Maxwell (1911) reported nesting by a single leatherback on 1st February; otherwise data on the reproductive phenology of this species are unavailable for Myanmar. Elsewhere in the region, leatherbacks nest from October through March with a peak in December (Limpus et al., 1984; Eckert et al., 2012; Swaminathan et al., 2017). Five live hatchlings and 11 unhatched eggs were found when the nest was excavated on the morning of 23rd February 2017. Yolkless eggs (Eckert et al., 2012) may have been among those that failed to hatch, although this was not determined when the nest was excavated. e hatchlings were held during the day and released shortly a er nightfall. Although the number of eggs in the nest was not determined, clutch size reported for other leatherback populations in the eastern Indian Ocean ranges from 29 to 140 eggs (Eckert et al., 2012). To our knowledge this is the first confirmed nesting of D. coriacea in Myanmar in recent years, one of the few nesting records ever reported for the country (Maxwell, 1911), and further highlights the importance of LMNP to marine turtle conservation in the region (see also Platt et al., 2015). According to the IUCN (2017), recovery of the biologically relevant subpopulations of D. coriacea is dependent on successful conservation actions that mitigate current and future threats, especially those in breeding and foraging habitats. To this end, we recommend that nest protection and monitoring be continued at Wah Ale Kyun and Honey Moon beaches and extended to include Bi Thaung, La Pyat Aw, and Hline Gyi Aw beaches in the southern part of LMNP. These beaches host a number of turtle nests each year, yet remain unprotected and subject to illegal egg harvesting, especially the latter two sites which are easily accessible from Ma Kyone Galet Village (Platt et al., 2015). Additionally, we strongly reiterate our earlier recommendation (Platt et al., 2015) that existing fishing regulations within the protected area must be rigorously enforced, particularly the prohibition of commercial trawlers from within the legal exclusion zone. Outside of the protected area, marine turtle conservation hinges on the rigorous enforcement of regulations requiring the use of Turtle Excluder Devices on commercial fishing trawls (Aung Hlaing Win & Maung Maung Win, 2012; Holmes et al., 2014). Without dramatic improvements in the effectiveness of conservation measures, all species of marine turtles will likely be approaching extinction in Myanmar by 2030 (Limpus, 2012). debt of gratitude is owed by CK to Bald Head Island Conservancy (North Carolina, USA) for spurring a long-standing interest in marine turtles, which ultimately led to the conservation program at LMNP. Win, A.H. & M.M. Win. 2012. Interaction between fishing activities and marine turtles in Myanmar. In: Proceedings 11th SEASTAR2000 Workshop, pp. 5-7. SEASTAR2000, Bangkok. Beffasti, L. & V. Galanti. 2011. Myanmar Protected Areas: Context, Current Status, and Challenges. Milan: Instituto Oikos, BANCA, and Ancora Libri, Milan. Eckert, K.L., B.P. Wallace, G.J. Frazier, S.A. Eckert, & P.C.H. Pritchard. 2012. Synopsis of biological data on the leatherback sea turtle (Dermochelys coriacea). U.S. Fish and Wildlife Service, Biological Technical Publication BTP-R4015-2012, Washington, D.C.
Hirth, H.F. 1980. Some aspects of the nesting behaviour and reproductive biology of sea turtles. American Zoologist 20: 507- 523. Holmes, K.E., T. Tun, K.T. Latt, M. Subedee, S.V. Khadke & A.E. Hostetler. 2014. Marine Conservation in Myanmar- e Current Knowledge of Marine Systems and Recommendations for Research and Conservation. Wildlife Conservation Society and Myanmar Marine Science Association, Yangon. IUCN. 2017. e IUCN Red List of threatened Species. http:// www.iucn.redlist.org. Accessed on 27th July 2017. Limpus, C.J. 2012. Assessment of Turtle Conservation Actions at Thameehla Island, Myanmar. Report to Department of Fisheries, Yangon, Myanmar. Limpus, C.J., N.C. McLachlan & J.D. Miller. 1984. Further observations on the breeding of Dermochelys coriacea in Queensland. Australian Wildlife Research 11: 567-571. Maxwell, F.D. 1911. Report on the turtle-banks of the Irrawaddy Division. In: Reports on Inland and Sea Fisheries in the Thongwa, Myaungmya, and Bassein Districts, and Turtle-banks of the Irrawaddy Division. Government Printing Office, Rangoon. Pp. 1-57. Nel, R., K. Shanker & G. Hughes. 2015. Leatherback populations in the Indian Ocean. In: e Leatherback Turtle: Biology and Conservation (eds. J.R. Spotila & P.S. Tomillo), pp. 121-131. Johns Hopkins University Press, Baltimore, USA. Platt, S.G., K. Platt, M.M. Soe, K.M. Myo, K.E. Holmes & T.R. Rainwater. 2015. Marine turtles and estuarine crocodiles in Lampi Marine National Park, Myanmar: A conservation and threat assessment with recommendations. Herpetological Review 46: 319-327. Swaminathan, S., S. Thesorrow, S. Watha, M. Manoharakrishnan, N. Namboothri & M. Chandi. 2017. Current status and distribution of threatened leatherback turtles and their nesting beaches in the Nicobar Group of islands. Indian Ocean Turtle Newsletter 25: 12-18. Thorbjarnarson, J.B., S.G. Platt & S.T. Khaing. 2000. Sea turtles in Myanmar: Past and present. Marine Turtle Newsletter 88: 10-11.